Educational Background: B.A. in English with a minor in Educational Studies from St. Mary’s College of Maryland; Current MLS graduate student with a specialization in Archives and Records Management. How she got here: During Laura’s last semester as an undergrad, she worked as a student assistant at the college library. After graduating, she knew she wanted to pursue Library Science but was unsure what specialization to choose. Laura also wanted to be sure she was picking a path that she would enjoy so she decided to work and gain more experience. Laura began working full time in the Access Services Department at the main academic library at West Virginia University. The people in that department were amazing and they provided great opportunities to learn skills that led to her current interests. She worked to improve her customer service skills with patrons, and she learned more about library school in general by talking with her supervisor at the time, and IU alum, Hilary Fredette. After 6 months in Access Services, she began working in the special collections department/archive at WVU. At the West Virginia & Regional History Center (WVRHC), she managed the historic photographs collection including selecting images to go online in the database, managing student workers, handling image requests and reproductions, and working to help with other projects. Laura’s position at the WVRHC led her to decide on the archives specialization. She had supportive mentors who encouraged her when she started applying to schools and making decisions. Their enthusiasm and knowledge showed her how many things archivists get to do and how they can make materials more accessible to patrons. Another alum from the program, Danielle Emerling who works at the WVRHC, coordinated with Carrie Schwier of the IU Archives to set up a time for Laura to visit the Archives when she visited the campus that spring. After seeing everything that IU and the MLS program had to offer, she decided this would be a good place to gain the experience and knowledge she needed to become an archivist. Now, she gets to work here and she loves it. 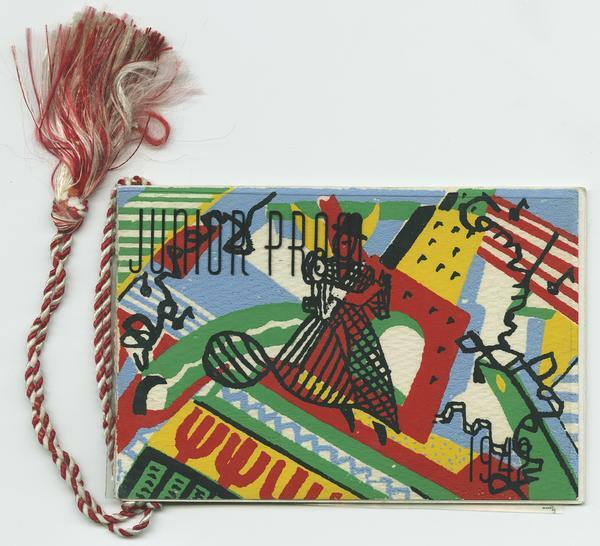 Favorite Collection in the IU Archives: The IU Dance Cards Collection. It was one of the first collections that she processed. Each dance card is unique and it was really interesting to see how many events there were on campus throughout the 1920s-1950s. Current Project: She is currently processing the Claire Robertson papers and working on other small projects as they come up. Favorite experience in the IU Archives: Hard to pick one! She enjoys processing collections the most, but she really enjoyed researching materials and finding images for East Meets Midwest: A History of Chinese Students at Indiana University, an exhibit that was displayed in the Wells Library in March 2017. What she’s learned from working here: Since Laura is from Maryland, the rivalry between IU and Purdue was news to her! She also just enjoys getting to learn the general history of the university and what it was like when it first began. 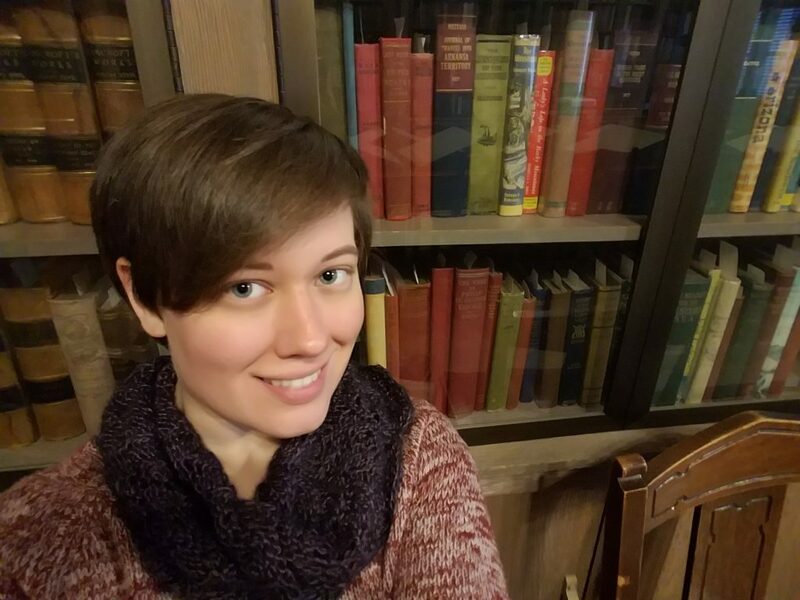 Educational Background: BA in History, BA in Art from Hillsdale College; Current MLS student with a specialization in archives and records management. How she got here: Julia started working in archives as an undergraduate at Hillsdale College. At the College, she mainly worked in special collections as the caretaker of the campus Library’s coin collection, but she occasionally helped the college Archivist with various projects. One particular project she enjoyed was helping to rearrange documents from the Winston Churchill Project. She also had the pleasure of working with and organizing an entire archives collection at a local historic house, the Grosvenor House Museum. When Julia volunteered for the Grosvenor House Museum, she never knew what to expect. It was like Christmas every day! One afternoon she would be flipping through a pile of graduation announcements from the local schools and the next she would be trying to identify individuals in a stack of nameless photos. There were old maps, rail road tickets, letters, articles on local war heroes…one time she and a friend found a military commission from King George III for a local townsman with its wax seal still intact! Meanwhile at the College, Julia would sift through and rehouse tons of letters between Winston Churchill and his wife, secretary notes from meetings, letters to dignitaries from around the world, and other great documents. After working with these collections, Julia knew that she wanted to work in an environment where she could interact with archives and special collections in some way, whether it be in a library, museum, or a similar institution. Julia began her dual MLS/Art History degree in the fall of 2015 and found work as a Public Services Assistant in Wells Library. 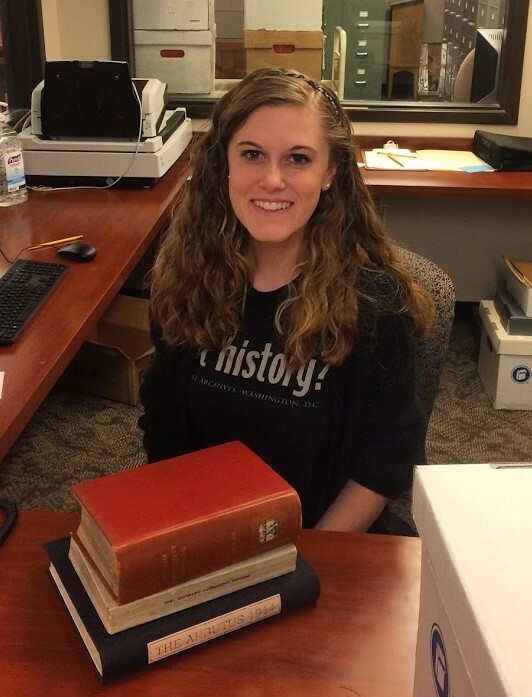 In the spring of 2016, she began processing collections for the IU Archives and transitioned into her current position as Bicentennial Oral History Intern the following semester. Favorite item in the collection: One of Julia’s favorite items in the archives is Volume 5 of the Sycamore Logbook from 1944-1945 from the IU Women’s Residence Halls scrapbooks (see more info about the scrapbooks in her posts titled “Snippets from Dorm Life” and “Mail Call“). She was reordering all of IU’s women’s dorm scrapbooks when she decided to flip through a few to get an idea of what these ladies were like. As she turned page after page of unidentified photographs, she wondered if she would find anything that would tell her their names or what their lives were like at IU. She turned a page and saw the headline “Mail Call.” She was immediately drawn to it because she knew the book was from around the end of World War II, meaning it had to be something about soldiers during the war. It turned out to be a really great piece describing a typical morning in Sycamore Hall where the ladies would dash downstairs immediately after waking up to see if there was news from the front lines. It really struck a chord with Julia and reminded her yet again the amazing things you get to discover while working in archives (and purely by accident too!). Current project: Julia interviews staff and alumni for the Oral History Project about their time here at IU. Favorite experience in the IU Archives: Julia loves when she is interviewing someone for the Oral History project and they talk about old student hangouts or past events. It’s really great because she can research these places and events after the interview and she always finds great things in our collections on them. Sitting there listening to them talk about these things really helps her to connect with our collections on a different level. It makes it all the more real to her. What she’s learned from working here: Restaurants, bookstores, and other places downtown have such a rich and wonderful history that are so interconnected to IU and its students. The best thing about it? Many of them still exist. It is wonderful to go into places Nick’s or the Gables after hearing about all of these different experiences and think about what it was like then versus now. 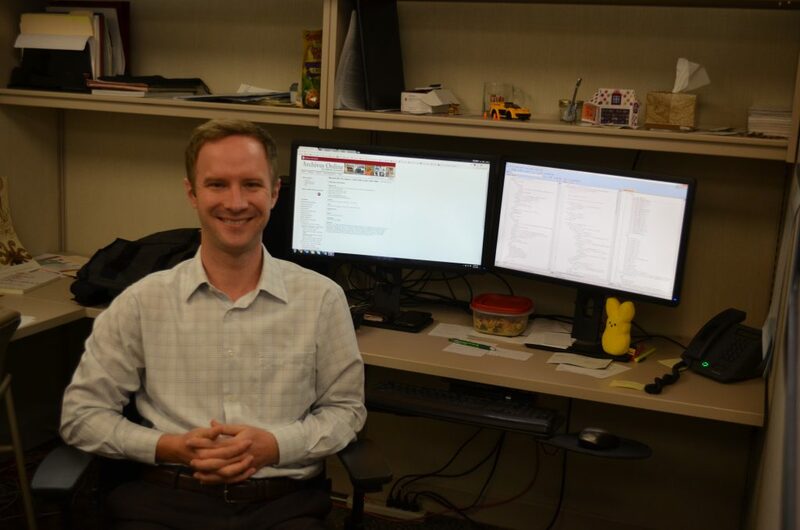 Role: Nick assists the IU Archives with digital projects and the ongoing use of services and workflows that his department manages. Previous Experience: Nick has worked in libraries and archival repositories since 2001, first as an undergraduate intern, followed by working for the Digital Library Program scanning sheet music while attending IU. When he worked as an orchestral musician in West Virginia, he also worked at a public and an academic library in paraprofessional positions. Nick’s first professional job was as a music librarian at the University of South Carolina. Favorite item in the collection: Nick loves the Archives Photograph Collection– he notes that it’s really interesting to see how our campus has grown over the past 200 years and he likes photos of familiar places from long ago. Current project: Lately, he has been working with collections of materials described in different ways- uniquely-formatted spreadsheets, databases, etc., and using XML technologies like XSLT and XQuery to quickly turn them into EAD container lists for Archives staff. Favorite experience with the IU Archives: Working on the IU Folklore Institute student papers finding aid has been great. Carrie Schwier, Outreach and Public Services Archivist, recently collaborated with Nick to programmatically produce an EAD container list from an Access database, and it was really gratifying to do. With the collection now publicly accessible, it was recently promoted at the American Folklore Society conference. What he’s learned from working with the IU Archives: Nick has learned how to have a successful social media strategy in a University department. The @IUBArchives twitter presence is really impressive, and other library units and centers on campus should use it as an example of how to reach out to thousands of potential users and share enthusiasm for really fascinating content. Role: Heidi runs the Born Digital Preservation Lab (BDPL), which works to preserve born-digital media, like floppy disks, CDs, hard drives, and electronic file directories. She works regularly with the University Archives to transfer media from physical collections to create disk images and store exact copies of the original media in IU’s secure long-term storage, SDA (Scholarly Data Archive). SDA is managed by the UITS Research Storage team. She’s been working extensively with IU Archives Assistant Archivist Mary Mellon to set up basic procedures and workflows for preserving born-digital media in the IU Archives’ collections. Educational Background: Heidi holds an MLIS from Wayne State University in Detroit and took part in the inaugural National Digital Stewardship Residency (NDSR) program at the Library of Congress in 2013. She does not have any archival training, which has been a challenge in some of her work with the BDPL because she’s not a digital archivist. Previous Experience: Heidi’s first job out of library school was at Nazarbayev University in Kazakhstan, where she ran the Digitization Centre and acted as subject liaison for the School of Humanities and Social Sciences. She had some previous background in working abroad prior to that, so she was looking for a librarian position abroad and got lucky to find one that basically let her set up a whole department. From there she took part in the NDSR program- which involved surveying digital assets at the Dumbarton Oaks Research Library and Collection, a small Harvard research collection for Byzantine, Pre-Columbian, and Garden and Landscape Studies. She received training from the top experts in digital preservation, like Nancy McGovern and former IU faculty Jake Nadal. When that finished she moved to The Hague and worked at a Royal Dutch Academy of Arts and Sciences institute, Huygens, to try and figure out long-term sustainability of their digital scholarly editions. Heidi got homesick for the Midwest though, and ended up here at IU. At IU, Heidi has taken part in open source development by taking over as the product owner on HydraDAM2, which is the preservation repository for all of the audiovisual content coming out of the large MDPI project. Favorite items in the IU Archives: The collections that have really unique media and present digital preservation challenges are probably the most interesting. Current project: It’s sort of ongoing and varied. She’s been imaging content from different collections as it comes, so it’s too broad to really say. Favorite experience in the IU Archives: She got to plug in an old hard drive of Mike Pence’s last month, to figure out how to preserve the content on it. That was pretty timely, and reminded her of the relevance her work. What she’s learned about IU: Dina Kellams gives a great presentation on the history of the IU Libraries, including the story behind the architectural design of the Herman B Wells Library. She stole Dina’s use of the term “triscuit architecture” when describing the building. How she got here: Katie’s favorite part of her undergraduate history classes was conducting research using primary materials. This interest led her to work at the Purdue University Archives and Special Collections as a student assistant. At Purdue, Katie assisted with the Purdue Oral History Project, inventoried 16mm film reels, and worked on a variety of digital projects. Because she enjoyed working with the amazing people and collections at Purdue, including the George Palmer Putnam Collection of Amelia Earhart Papers, she decided to pursue an MLS at IU (although she remains a Boilermaker at heart). Katie started working in the IU Archives as an Encoder for the Indiana University Faculty Council, but she switched to processing collections in January 2016. 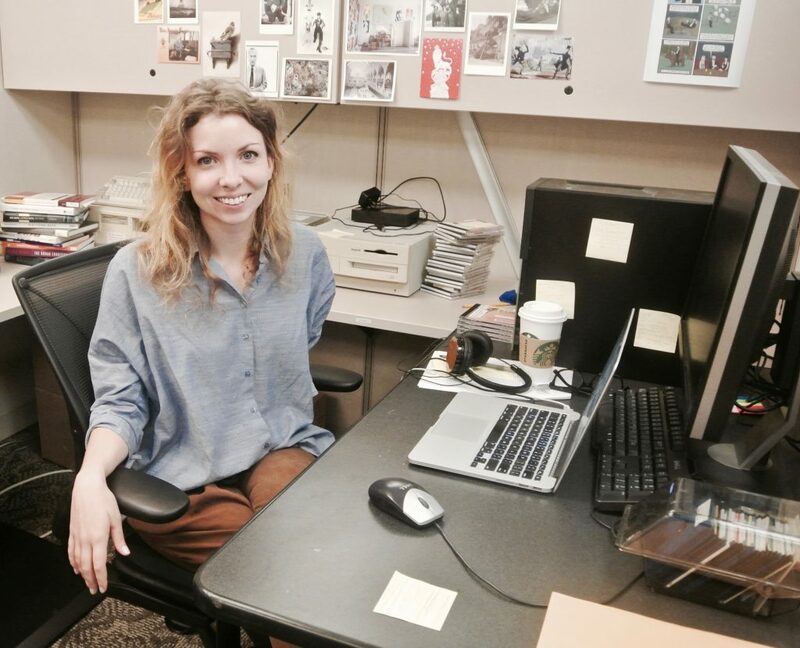 In the summer of 2016, Katie served as an Art Deco Trade Literature Research Intern with the Smithsonian Libraries at the National Museum of American History. At IU, Katie also worked for the Department of Information and Library as a special projects assistant and worked as a processor on the Richard G. Lugar Senatorial Papers team. 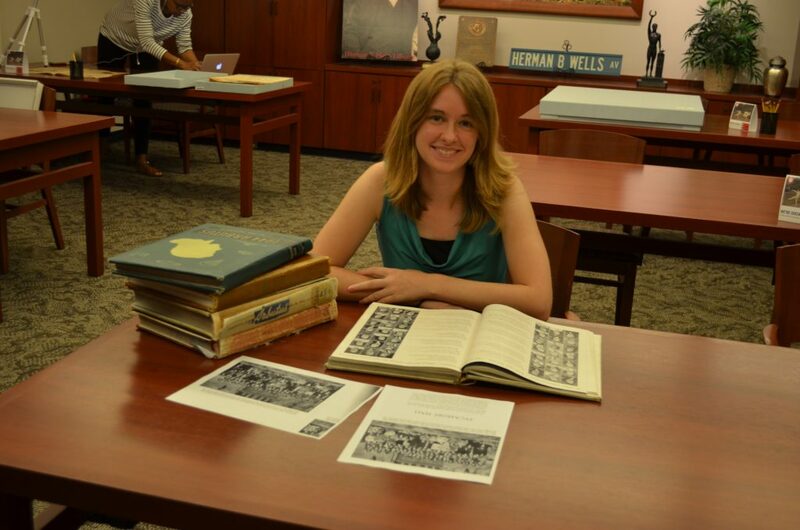 Favorite Collection in the IU Archives: Katie processed the Indiana University Folklore Archives records and collections. She considers it be one of the most amazing collections she will ever have the opportunity to work with. The collection is 32 boxes of folklore material collected over several decades from around the Midwest. There are files related to legends and stories from every county in Indiana, inappropriate college songs, multiple varients of modern horror legends, and jokes on almost every topic imaginable. Current Project: Katie just finished processing the Indiana University Department of Folklore and Ethnomusicology records and is now working on various folklore refiling projects. 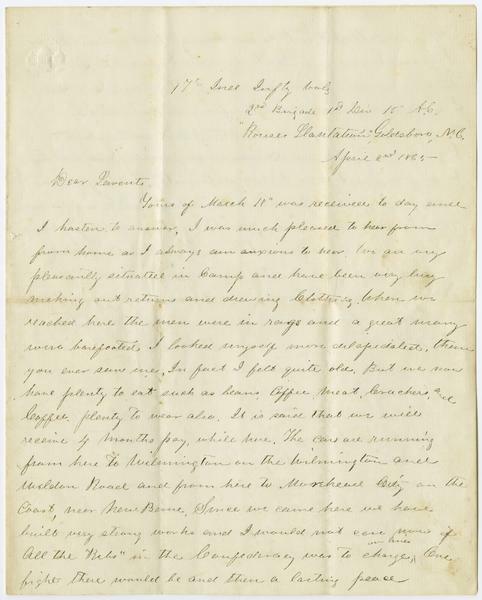 Favorite experience in the IU Archives: Katie loved processing the John D. Alexander papers, a collection of Civil War letters. Alexander graduated from IU in 1861 and enlisted as a private in Company E 97th Regiment of the Indiana Volunteers in 1862. It is moving to read the letters he wrote home to his family during Sherman’s March to the Sea from November – December 1865. The collection has been digitized and is accessible online. Katie also enjoys working with the fantastic IU Archives staff who serve as such great mentors! What she’s learned from working here: Katie has learned quite a bit about the field of folklore from processing the Indiana University Folklore Archives records and collections, the Roger Mitchell collection of Micronesian folktales, and the Department of Folklore and Ethnomusicology records. Before working with these collections, she did not realize there was an entire system for organizing and classifying folktales, the Aarne–Thompson classification systems. The system was partly developed by Dr. Stith Thompson, a folklorist who taught at IU. Also, if the stories are to be believed, there are quite a few ghosts on IU’s campus!